“In a way, their interest is served by it being known that he was flat-out railroaded, falsely convicted, that they orchestrated this as a consequence for basically standing on his rights and not equivocating. Note: This episode of the Global Research News Hour is a repeat broadcast, first aired on February 5, 2016. It is a reminder to listeners that Leonard Peltier has served over four decades in prison based on what Amnesty International among others consider an unjust court process, and in the face of evidence that points to FBI coercion. His health is failing and we will likely not live to see his next parole hearing in 2024. 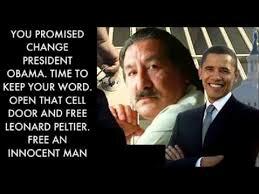 Outgoing President Barrack Obama is in a position to grant Peltier a pardon. Readers can contact President Obama through the following form. Canadian readers can appeal to the Canadian Prime Minister to lobby the President by emailing [email protected] . Saturday February 6 marks the fortieth year of Leonard Peltier’s imprisonment on the charge of murdering two FBI agents. Peltier was an activist with the American Indian Movement in the mid-1970s. He had been called into a community to try to restore peace and security on the Pine Ridge Reservation in South Dakota at a time when politically motivated violence on the territory was in proportionate terms rivalling the death count in post-Allende Chile. A firefight which erupted on the Jumping Bull ranch claimed the lives of FBI agents Jack Coler and Ron Williams as well as a young native man named Joe Stuntz. The FBI set about trying to implicate Peltier and two other AIM members by fair means or foul. Despite a number of legal irregularities and demonstrably fabricated evidence, Leonard Peltier was charged with the murder and continues to serve two consecutive life sentences. Numerous individuals and groups have rallied to the cause of justice for Peltier. These include Nobel Laureates Jose Ramos Horta, the late Nelson Mandela, the Dalai Lama, Angela Davis, Former Attorney General Ramsey Clark, The National Association of Criminal Justice Lawyers, the National lAwyers Guild, the Parliaments of Belgium, Europe and Italy, Jane Fonda, Peter Coyote, Whoopi Goldberg, Danny Glover, Harry Belafonte, and Robert Redford and dozens of Native American and Tribal leaders, representatives of the religious and faith communities, civil rights organizations, scholars, artists and celebrities. COINTELPRO was the latest variation of a strategy used by the Federal Bureau of Investigation and its antecedents to control popular resistance movements. On this installment of the Global Research News Hour, the last of a trilogy of stories dedicated to American political prisoners, we speak with Ward Churchill . In this interview, Churchill discusses the history of Counterintelligence activities in the United States leading up to the COINTELPRO program of the 1960s, the involvement of the American Indian Movement in Pine Ridge Indian Reservation, and the case of Leonard Peltier who he argues has been unjustly arrested and incarcerated. The Global Research News Hour airs every Friday at 1pm CT on CKUW 95.9FM in Winnipeg. The programme is also podcast at globalresearch.ca . The show can be heard on the Progressive Radio Network at prn.fm. Listen in every Monday at 3pm ET. It is also available on 93.9 FM cable in the communities of SFU, Burnaby, New Westminister, Coquitlam, Port Coquitlam, Port Moody, Surrey and Delta, in British Columbia, Canada. – Tune in every Saturday at 6am. Campus and community radio CFMH 107.3fm in Saint John airs the Global Research News Hour Fridays at 10am.